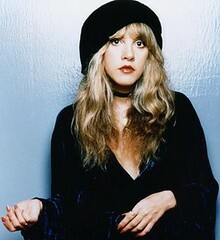 During her time as a member of Fleetwood Mac, Stevie Nicks filled many roles: singer, songwriter, muse, tambourine player and main hottie. As a contributor to the Mac’s legendary Rumours album, Nicks sealed her place in history as one of the great original rock & roll heroines. After penning some of the band’s biggest tunes (including otherworldly classics such as “Dreams,” “Rhiannon” and “Landslide”), the 60-year-old went on to enjoy a successful solo career, scoring hits with songs like “Edge of Seventeen” and “Stop Draggin’ My Heart Around”. These days Nicks is still working the witchy hippie thing, what with her suede boots, shimmery scarves, untamed mane and trademark twirling dance moves. Her infrequent tours command top dollar, as Miss Nicks is still a powerful performer who has grown into her delightfully distinctive voice.